At Colorado Party Rentals we love tented events! One of our favorite tents is called the Sailcloth Tidewater Tent. Constructed of sailcloth material the tents have sculpted peaks and eaves, with a no-valance design. Translucent with ribbed stitching, the sailcloth allows natural light to enhance any daytime event and glows brilliantly when lit for evening gatherings. The sailcloth tent is oval and has wood-like side poles and center poles. Available in 44′ widths. Looking for a cleat top tent? Then Navi-Trac is the tent for you. An assembled framework of beams allows for white or clear panels to slide through the beams to create a much stronger and quieter tent. There are no interior center poles in the tent. The interior look is also much cleaner as fewer buckles and straps are needed to secure the fabric roof to the frame. The tensioning is achieved with the sliding of the fabric panels into the beams. Interested in dramatic sweeping slopes of a pole tent? 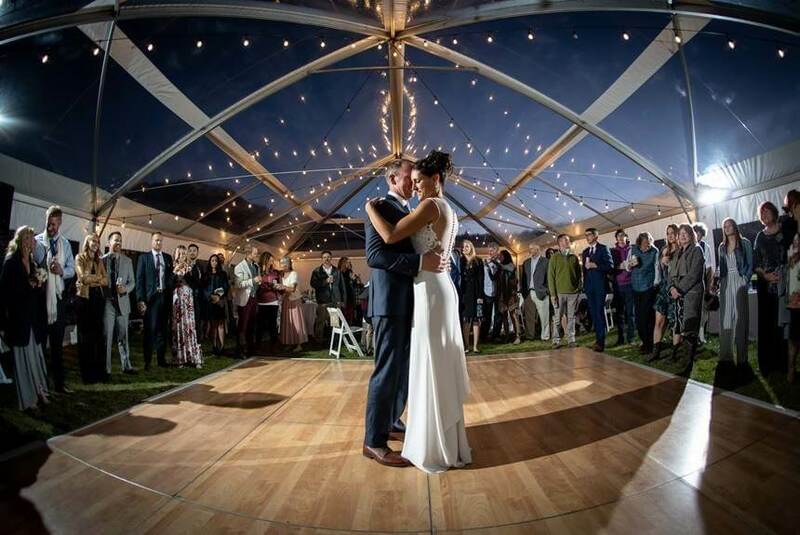 Century pole tents are our most popular wedding tenting through a combination of style and budget friendliness. These tents are a high peak tension style that rely on the tensioning of the fabric roof for its structural integrity and shape. there is no interior frame work visible under the tent as the vinyl fabric roof is supported by center poles which creates the high peak look. The Century tent has more traditional square or rectangular shape and is available in 30′, 40′ or 60′ widths. Perfect for smaller weddings or festivals, the Peak frame tents are a popular alternative to our classic frame styles. Offering a more dramatic peak aesthetic this tent is a versatile option will all anchoring options available. The easiest and simplest tent we offer, the pop-up tent is used widely at farmers markets, single day festivals, non-profit events and small gatherings in parks and backyards. Meant for shade protection, the pop-up is note designed to compete with much wind and needs to be evacuated and taken down as soon as wind gust get over 20 mph. This tent is available for customer pickup and return.